Chris Detrick shoots from all over the Bren Events Center during the U.C. Irvine - U.C. Davis basketball game at the Sports Shooter Academy. In the background are SSA staff members Jeff Botarri and Max Morse along with faculty member Matt Brown. Before spending five days in rainy Southern California with dozens of other talented photographers, I thought that supply and demand was just a lecture I slept through in college economics. I had no idea that the lesson might actually be useful to me. But, to be honest, it was one of the most important lessons I learned at Sports Shooter Academy. Dave Black's principle of photographic success is based on supply and demand. How can you make valuable pictures? By separating yourself from the competition and making pictures no one else has, you create a good that is in short supply, but high demand. This can be accomplished by becoming a student of your subject and venue, shooting the "decisive moment" of the game as well as photographing other features both on and off the court. By doing this, not only will you have valuable pictures, but you will have helped to raise the industry standard for that sport or subject. I had to separate myself from 31 other energetic Academy students saturating Big West venues. Having photographers swarm the courts and athletes like flies on meat made it challenging to make unique pictures but everyday it was important to remember Black's tutorial. One fun technique I experimented with was one I read about on Thomas Witte's website: Camera on a stick. Armed with my camera, monopod and a cable release, I pretended to be a boom-mic operator and shot pictures holding the camera four feet above my head. This especially came in handy when the energized fans rushed the court after the Cal State Fullerton men's basketball team upset Utah State in a stunning 64-60 victory, securing their first winning season since 1993. The Camera Kabob gave me a higher angle and a different perspective in a frenzied post-game celebration. All too often sports photographers forget the emotions attached with athletics, Black's supply and demand theory reinforced paying attention to off-court action. As one of two sports photographers for the University of Missouri (the other being fellow SS Academy student Kyle Coburn), I have shot a lot of game action in the past year and not too many features off the court or field. So, for several of the games, I concentrated on making pictures anywhere but the actual field of play. 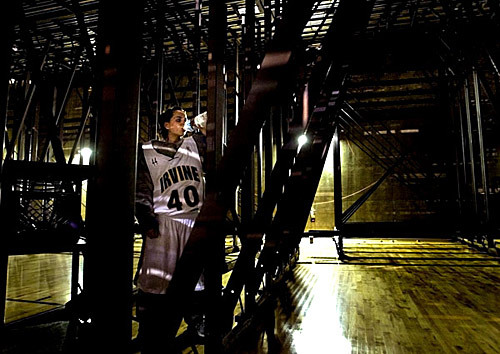 During the women's basketball game Thursday night at UC-Irvine, I shadowed their mascot, Peter the Anteater, and made a few pictures as she took a water break under the bleachers at halftime. Peter the Anteater takes a water break under the bleachers at halftime. At the men's basketball game Friday night at UC-Irvine, I shot some of the cheerleaders warming up. I did not know at the time, but a scuffle had just taken place between two of the cheerleaders. Although I did not see the actual fight take place, I captured the emotional reaction to something that many photographers would have missed had they been too focused on the upcoming action and not paying attention to the peripheral details. And, ironically, these two pictures I mentioned are some of my favorites from the workshop. I suppose they're my favorites because they're different, a different way of thinking at an athletic event. I will never forget the valuable lessons learned at the Academy. 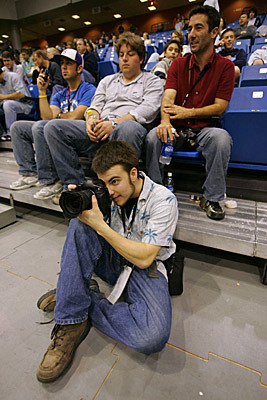 Thank you for including me in the inaugural class of Sports Shooter Academy 2005. Many thanks go to the Academy and the Big West Conference and Nikon for supplying the events, the professionals, the tutorials, the laughs, the energetic photographers, endless supply of equipment and unforgettable memories - from shooting the amazing Ralphy while perched on top of lockers to late night Thai karaoke featuring vocal superstars Matt Brown and Darrell Miho. And special thanks go to the other student photographers for being demanding enough, and persistent enough, to all make great pictures and have a wonderful week. I hope to run into you all on the sidelines in the future.